William Vinson was born on March 16th 2010. He was initially a very healthy little boy. 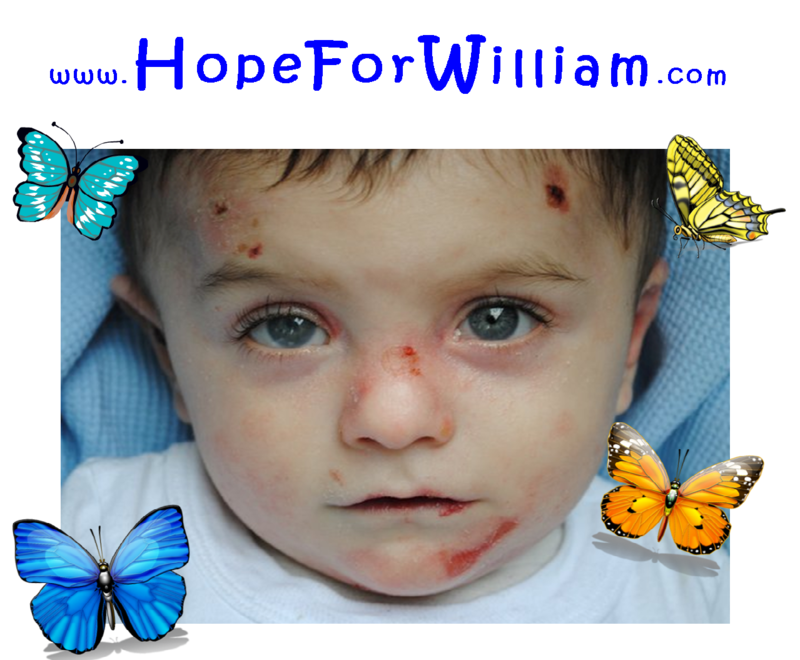 Within a few short hours, William developed signs of a very serious complication with his skin. Shortly thereafter, he was diagnosed with Epidermolysis Bullosa (EB) a chronic, painful, genetic skin disorder with no known cure. This blog was created by Anim’s (William’s Mother) sister, Larina McClain. I do this to create awareness and have a place to post updates for our Bi-Annual charity golf tournament that we began hosting back in 2014 in Colorado to raise money for kids who suffer from this debilitating condition. WHAT IS EB?……..Imagine life were every moment is constant pain. EB children are referred to as Butterfly children because their skin is as delicate as a butterfly’s wings. Imagine life as a mother, wanting to comfort your child in pain but you cannot, because the slightest friction will cause your childs skin to blister and tear. EB children must keep their entire bodies wrapped in bandages to protect their skin. Bandages must be changed every other day and can take three adults up to four hours to complete. WILLIAM?…….. He is an Angel. He smiles all the time in spite of the pain. He has already brought joy into so many peoples lives. In spite of his mouth being blistered inside, he eats, laughs and even walks. He loves interaction and any kid of learning experience, art, science, nature, horseback riding, and most of all music! Since this journey began, I’ve had the pleasure of meeting one of the most respected people in the EB community. Her name is Laurie Sterner. She does not have a child or relative with EB. She has just chosen to dedicate much of her life and time to actively supporting families in need that have a child with EB. To read her story please visit her website at: www.thebutterflyfund.org She has set up the Butterfly Fund that we are raising money for in our 4th Bi-Annual “Birdies for Butterflies” Golf Tournament. 100% of the Funds donated there will go directly to help many EB families in need. To learn more about this incredible event Birdies for Butterflies on September 12th 2016, visit the tab at the top or click here to get all the details. Thank you so very much for your thoughts, prayers and donations. They are greatly appreciated, more then you know. To see more short videos that I took of William while visiting him in the hospital click this link. To read the latest posts or to follow the blog on William aka “Bill”, click on the Blog Archive Tab above. I posted a brief story and one of the youtube videos on my cause on Facebook – the butterfly Fund. To date, almost 500 people have watched and send you all their love and prayers. You are an amazing family and how lucky William is to be with all of you. Thank you for the updates – there really are so many people out there who truly care. I think of all of you everyday and you inspire me and push me to keep raising awareness. What a beautiful baby boy! thanks jayne roddy for sharing william’s story. God Bless all of you! i wish i could do more! i will keep all of you in my prayers! As a mom I can’t imagine how hard it is to see your child suffer like this. My heart and my as well as my families prayers are with you and your beautiful little boy. I really believe that God will see you guys through this and he will do great things as long as you keep your faith. God bless you both. He looks like a sweet baby boy!!! I’m so sorry to hear about him and his condition, our prayers and thoughts our with you and your family!!! I pray that his time spent with you and your family is the most precious time of all!!!! William & mother are absolutely amazing. I added your family to my prayers & fervently ask that their comfort be found. I am hoping that Fox31’s segment tonight ignites a fire for the awareness to this disease. My family, in the last few years, has come aware of another disease not yet also familiar to the common public. My cousin’s child was diagnosed with Krabe’s, a type of “dystrophy” that is not tested for prior to child birth. The sad thing is, it can be cured if found prior to child birth. I hope & pray that William’s illness, like my cousin Hadley’s illness, can be recognized & sought out by doctors so that cures can be tested & found. God bless your family & those that come down your path that can ease the pain your family go through. My love, heart, & prayers go out to you and your family! I am filled with awe at the strength and love. Your faith in God incredible, mine was questioned when I saw this. You have blessed me William. I just saw the story about William on the news tonight and I felt so many emotions inside. I was so proud of you, mom, that you can be so strong through everything. I felt so sad for William, but knew that he was here for a reason like you said and would teach us all a lesson we won’t forget. I felt selfish for ever thinking that I had things bad and made me count my blessings. My prayers are with all of you and I know that that beautiful little boy will be ok, he has a wonderful family to support him and the prayers and thoughts of the world. Bless all of you. I just saw Williams story on fox news and it brought me to tears, no joke. I applaud you and your family for being so strong and supportive for william and his needs. If you guys need help with anything whether it be raising awareness about EB, donating money to help pay for supplies or if William ever wants someone to play with, I have a little brother and he’s always up for making new friends. My thoughts go out to you and your family. I am impressed by all your dedication and care for your sweet boy. I am marking your blog for future use to give to other parents that may go through similar situations as your family has. I work in an NICU as a parent support person. We just had one family leave our NICU (finally) who was experiencing the same thing. God Bless you, and I will be keeping you all in prayer. Hi Larina, I saw William’s story on the news the other night and have not been able to stop thinking about him and his family. This story truly touched my heart. I too have a 2 yr. old and can not imagine having my child in constant pain and knowing that the loving arms that are suppose to care for him and comfort him can bring more pain. I could not sleep the night that I saw the story air and all I could do was pray for him. I asked God if there is anything that I personally can do to help and it came to me to contact an acquaintance that I have that is nutritional therapist. I asked her to view the story and let me know if she knew of anything along the health/nutrition aspect that could be done to help little William. She did email me back with some information. If William’s family would be willing I would like to pay for any testing and nutritional supplements that may be able to help him. I know so many times we rely on conventional medicine when I really believe that God has given us everything we need here on this earth to help with the ailments that we may face. If you would please pass my information along I would appreciate it. I will be praying for William and his family. My email is onewaymortgage@comcast.net. Wow It touches my heart when I get these kind of responses. I realize what wonderful people there are in this world and how big some peoples hearts are. I am encouraged that because of this, someday there will be a cure! I sent you a response to your e-mail.